.:. Hiking in Big Sur - Willow Creek Trail .:. Once you've parked, start down the unmarked road towards the creek to the north. The road/path is fairly well graded at first, but quickly becomes deeply overgrown and rutted and continues for roughly a mile. At one point a side road goes off to the left, but continue straight ahead. There are a couple opportunities to catch a glimpse up and down Willow Creek canyon with great open views. Eventually, the road/path ends at a parking/camping area under a small grove of redwoods, and continues straight ahead as a small path under the trees. 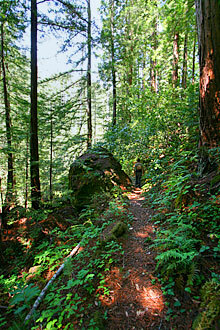 You'll now be traveling primarily in the shade along a fairly well maintained path through redwoods and their lush understory. There are also oak, bay, maple and pine trees scattered along the canyon wall in addition to a bit of poison oak here and there. 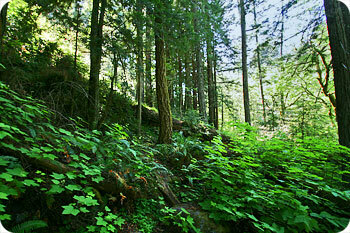 The Willow Creek watershed also houses the largest stand of Douglas fir on the central coast. Eventually, you'll come to the first fork in the trail just after seeing a small blank wooden sign hanging from a tree on the left. The left path leads down to the creek and the old homestead, while the right one continues on to the campsites and end of trail. Take the left fork and you'll wind quickly down to Willow Creek where you can rest under the redwoods on large boulders that have tumbled into the stream bed. If the water is not too high, this is a good place to hike up and down the creekthere are several alluring pools and sunny rocks to sit on. This is also the location for one of the most interesting redwood trees we've come across. There is a large dead and grey redwood log that has fallen across some boulders on the south side of the stream, suspended a foot or two above the stream bed like a huge bridge. Right on top of this log are a group of small redwoods seemingly growing up in mid-air. That is until you notice they have a common root that follows along underneath the log until it hits the ground. Fascinating. You might have seen a couple of stone steps on your way down, and if you continue to the other side of the creek and upstream a bit, you'll come across the foundation and crumbling fireplace of an old homestead that has long since vanished. There is also a nice campsite here. Poking around the homestead, you can find a couple large eye bolts embedded in the rock that used to anchor an 80 foot long suspension bridge crossing the creek. The Ventana Wilderness Alliance removed the dangerous and decrepit bridge a couple years back to prevent someone from getting hurt trying to cross it (apparently, somebody was attempting to restore it). Back up on the main trail and heading upstream again, after a short distance you'll find one more fork to the left, but this one peters out shortly near the creek. If you follow the main trail all the way out, you'll pass a couple more wonderful campsites, a large redwood bench, and eventually end up at a rocky creek crossing just past the last camp site. This is another great place to explore up and down the stream bed, and is also our turnaround spot. If your car/truck can handle it, continue up Willow Creek road which threads through the trees and eventually joins the South Coast Ridge Road. Going north, SCR Road crosses Nacimiento-Fergusson Road, and heading south travels near several of the tallest mountains in the Silver Peak Wilderness. Back at Highway 1 and less than a mile north of the Willow Creek Road turnoff, there is a nice Vista Point pullout on the ocean side of the road above where Willow Creek enters the ocean. You can park up above or drive down to a lower parking area that sits right next to the creek and beach. There are restrooms here. The Willow Creek Trail starts as a largely unmaintained side road off of Willow Creek Road. The Willow Creek Road turnoff is on the inland side of Highway 1, just a 1.1 miles north of Gorda or 27.6 miles north of the Hearst Castle turnoff. 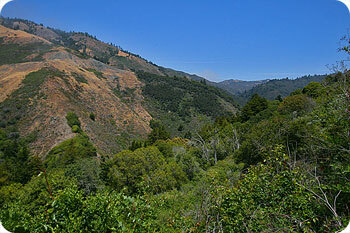 Travelling south on Highway 1, the Willow Creek Road turnoff is 11.9 miles south of Lucia or 36 miles south of the entrance to Pfeiffer Big Sur State Park. The Willow Creek Road turnoff shares the entrance to the TreeBones resort, so look for the TreeBones sign on the east side of the highway. As soon as you turn off Highway 1, Willow Creek Road is the graded dirt road to the left, while the paved road to the right goes to the resort. Willow Creek Road, though graded regularly by the county, can be a bit roughalthough I've seen a Toyota Camry station wagon make it to the trailhead. I would leave the sports car home for this one, and a truck is preferred. The road is marked as impassable in wet weather. Once you've started up the gravel road, proceed 2.4 miles until you see an unmarked dirt road (our trailhead) drop off on the left (see photo). Just before you get to the trailhead is a small pullout on the right where you'll want to park. If you have a four-wheel drive vehicle and want to shorten your walking time, you can try driving down the trail road a bit to see how far you can go. I've seen trucks make it all the way to the end of the deeply rutted road part of the trail about a mile in. There are a couple camping places to pull off along this stretch too. Good luck.